The divine lamb dish featured here is a perfect example of the excellent food served at El Olivo. This romantic restaurant, in a restored olive-oil mill, is a great spot to wine and dine someone special — the many wax-drenched candelabras are a very nice touch. Service is impeccable, friendly, and attentive, including a sommelier at the ready to pair Spanish wines with the delicious local cuisine. El Olivo is one of three restaurants located in La Residencia, a beautiful resort in the western Majorca town of Deià. Re-warm sauce over low heat, stirring occasionally. 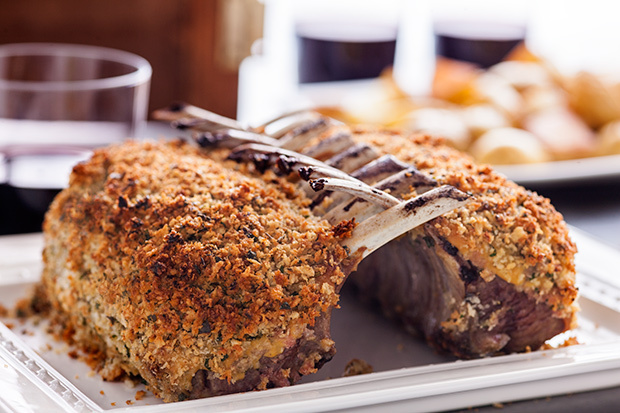 Cut lamb between bones and serve with sauce.